*20% discount is valid on antibodies and antibody panel packs. 19% discount is valid on #P-1030 & #P-1032 kits only. US customers only. Not valid for distributors or resellers. Cannot be combined with any other discounts, quotes, or offers. Expires January 31, 2019. 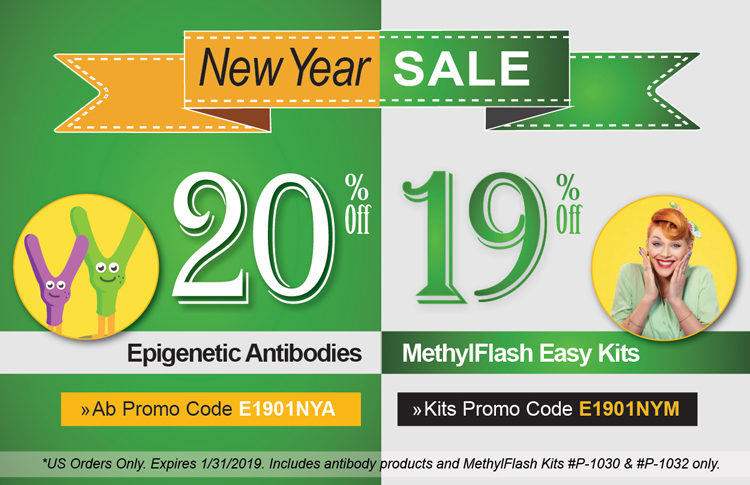 Save 20% on all epigenetic antibodies and 19% on MethylFlash ELISA Easy Kits (#P-1030 & #P-1032) only now through January 31, 2019. Please contact your regional distributor to see if there are any promotions available.